Monstermaker Revised - The rule is simple. YOU make the scenario. This game aims to explore a dungeon. You play "Corridor" cards to move in the dungeon. When the sum of the numbers on the "Corridor" cards reaches 100 or over, you are regarded to reach the treasure room. Then, you go back your way out. You can come back alive when the sum of the numbers on the "Corridor" cards of the back half is the same as the first half. You may disturb other players with playing "Monster" cards. To defeat a "Monster" card, a player have to play "Character" cards or a "Detour" card. A "Trap" card sometimes appears unexpectedly and cause a disaster. The players compete with each others to be the first one to come back out alive. The rule is simple and needs only an easy calculation. This game needs at least 2 players, but it is suitable for 3 to 6 players. The whole play takes about 20 to 30 minutes. The outlined numbers at the right-bottom are "Weight Points" for constructing an deck. 1. Shuffle the cards well, and deal out 7 cards each. The rest makes a stock deck. 2. If there is a "Trap" card in the dealt 7 cards, the player have to give it back to the stock deck and draw a new card. 3. Decide who plays first with dice or so. The winner of the last game takes the first turn if the game is played repeatedly. 1. Draw a card from the stock deck. 2. If the card is a "Trap" card, open it to others. You have to discard 3 cards from your hands and put them to the top of the pile deck. If you have a "Thief" card in your hands, you may discard it instead of 3 cards. Then your turn ends and the player on your left side takes his/her turn. If there is a player who have no "Monster" card on his field, you may play a "Monster" card to the player. However, you can not play a "Monster" card to a player who has no "Corridor" card on his/her field. If you have no "Monster" card on your field, you may a "Corridor" card on your field. The card should be placed in front of you with the face up. When the sum of your "Corridor" lengths is 100 or over, you can declare the arrival at the treasure room. After the declaration, you end the first half of your exploration and begin the way to return. Discard the "Corridor" cards you used to the pile deck. If the distance is more than 100, discard only 100 to the pile deck and keep the rest lied in your field. When the distance reaches exactly the same distance of the first half, you successfully come back alive. If you have a "Monster" card on your field, you may play a "Detour" card. It removes the "Monster" card and the newest "Corridor" card on your field. If you have a "Monster" card on your field, you may play "Character" cards. (You can play more than one card.) When you play "Character" cards, roll dice to decide the offensive power. You can defeat the monster if the offensive power is even or higher than the monster's defensive power. After defeating the monster, discard the "Monster" card and the "Character" cards to the pile deck. Example: A fighter "Millienne" attacks a "Giant Worm". "Millienne" has 5D+2 offensive power; therefore you roll five dice and add 2 to the number to determine the value. The "Giant Worm" has 16 defensive power. You will win if you hit 14 or more with the five dice. If you are playing more than 2 "Character" cards, add up all offensive power of the characters. If you lose, the "Monster" card remains on your field. You need to pile the "Character" cards you used after the fight. You may play one or more "Spell" cards as well as the "Character" cards. It increases the characters' offensive power up. You can not play the "Spell" card without "Character". 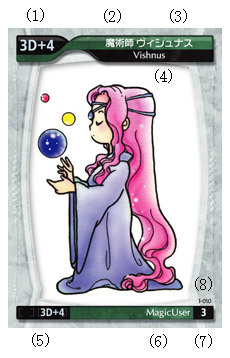 "Sleep" or "Charm" cards only affect the "Human type" monster. If there is a "Magic User" or an "Elf" in the battle you used "Charm", you may put the "Monster" you just defeated to other player's field. You can not play the "Monster" card to the player who already has a "Monster" card on his/her field. You may also play a "Cleric" card. It can defeat an "Undead" monster right away. You may play a "Cleric" card after a battle to get a piled "Character" card back to your hands at the end of the fight. 4. Check your hands. If you have 8 cards, you have to discard a card to keep your cards 7 or less. After that, the player on your left side takes his/her turn. When someone comes back alive, the player wins. Afterwards, everyone is prohibited to draw cards from the stock deck. The rest of players only play the cards in their hands. The players who have already come back alive have to wait although they have cards in their hands. This game ends when all players come back alive or pass. The players are ranked by the order of the returning. The players who could not come back have no rank. When there is no card in the stock deck, shuffle piled deck and use it as a stock deck. When there are 5 players, the distance to the treasure room is set to 80. When there are 6 players, the distance is set to 70. You may decide how many times you need to make a round trip between the entrance and the treasure room. When you arrive at the treasure room, you can roll one dice, and get [1D x 100] gold. You can get the gold only when you come back out alive. When a game ends, [number of players x 100] gold are divided to all the survivors. This is how you divide the money: 100 gold for all the survivors except the 1st place winner and the rest of money to the 1st place winner. You may write the amount of money you got down or use game chips to remember.100 gold are for all players except 1st and the rest for the 1st. You may write down the amount of gold you got or use game chips to remember. The final winner is the richest player of all. Like any trading card games, you can make your own deck and play. This rule allows two persons play. (Of course 3 or more persons can play together at the same time as well.) There are 2 differences between this rule and the other trading card games. Kinds of cards you can have in your deck are limited (Your may have 1 "Character" card, 2 "Corridor length 40" cards, 3 "Trap" cards at most.) Each card has a "weight point" and the sum of the weight points of players' decks must be 100 or less. The deck construction rule differs a few as the folloing. Weight points are the outlined numbers at the right-bottom of each card. Weight point of "Corridor length 5" is -1. It means that the sum of the weight points of a player's deck decreases depending on the numbers of "Corridor length 5" he/she has in the deck. The cards that have the same function might have different weights in return for the cards' powerful effects. The sum of the weight point must be no more than 100. The number of cards in a deck must be 40 to 60. You draw a card from YOUR stock deck. You may play a "Detour" card. (1) You may have a battle if a monster is on your field. If you defeated the monster, you may play a "Corridor length 5" card or any card with its face down as a "Corridor length 5". (2) You may play a corridor card if no monster is on your field. If you defeated an undead monster with a CLERIC card, you may play a "Corridor length 5" card or any card with its face down as a "Corridor length 5". You may play a monster card to other player who has no monster on his/her field. You have to discard 1 card when you have 8 cards in your hands. You can pass except phase1 and 5. If a "Trap" card is played on your field, you may discard a "Thief" card in your hands, and the "Trap" card becomes ineffective. Discard a "Thief" card. Then, choose a player and declare a card name. The player you have chosen have to discard all cards that you declared. When the player does not have the card you declared or when the cards that you named exist two or more in a card set, the player has to open his/her hands. You may play this any time in your turn. When you are targetted for "destructive maneuvering", you may also discard a "Thief" card to prevent. Then both thieves need to roll dice to fight. Compare each offensive power, and you win if it is higher or even. You may keep "Trap" card on your hands and play it to other player. The player who has given a "Trap" card on his/her field have to discard 3 cards immediately. You may play this any time in your turn. You may play "Spell" cards, but only with a "Magic User". You may play any card as a "Corridor length 5" card if the card is played faced down on your field. When your battle is with your "Elf" card(s), you may discard 1 card before you roll dice. Then you get +1D additional offensive power. When your battle is with your "Dwarf" card(s), you may discard 1 card before you roll dice. Then you get +2 additional offensive power. If two or more players have come back alive, the player who takes the longest distance wins. If two or more players take the longest distance, the first comer among them wins. When your stock deck is empty, you play without drawing from your stock deck. When all players have no stock decks, the game ends. When all players have come back alive, the game ends too. When you have a monster on your field, the newest corridor card does not count. If both players have come the same distance, the player who has more weight points in his/her hands wins. When you count the weight points, cards with 0 weight points are regarded as 0.1 weight points each. The ranks in the convention are decided by the number of winning times, then by the winning points if the winning times are even. Translated by Ginga SHIBASAKI, cooperated with Miyu.